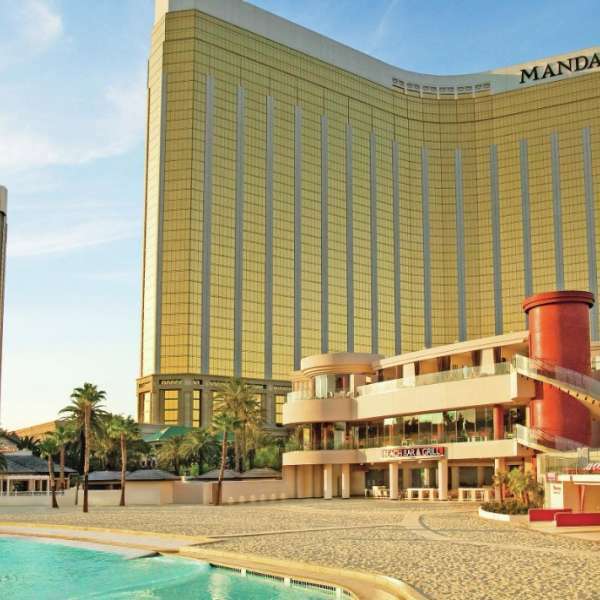 Mandalay Bay Beach is an 11-acre aquatic playground that invites you to sun, swim, splash and soak on your terms. Ride tides in the wave pool. Flow with the Lazy River. Lounge in a lagoon. 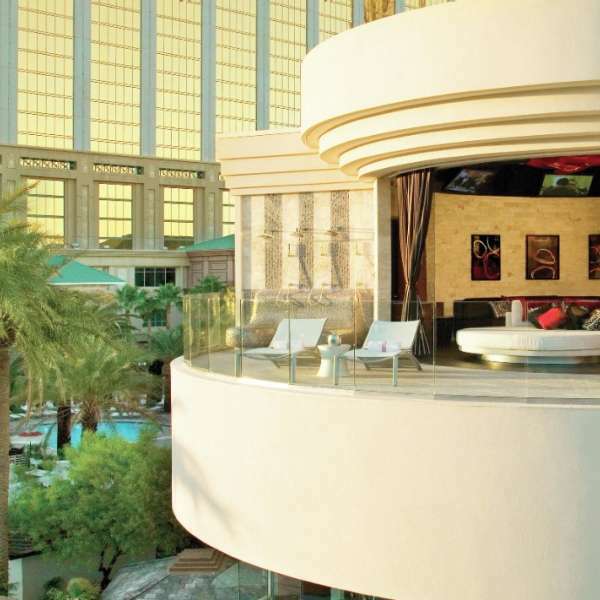 Catch some shade in a convenient cabana. And, when you’re ready to refuel grab a bite at Beach Bar and Grill or cocktail at one of three bars. Discover a personalized pool experience. It’s your beach. Dive in. You must be 48" to swim in the wave pool. 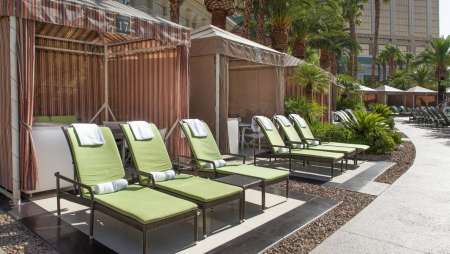 Mandalay Bay Beach and Moorea Beach Club offer 100 luxury cabanas, day beds, bungalows and villas. Located on the beach of our 1.6-million gallon Wave Pool, these spectacular cabanas capture the essence of our resort. Featuring a flat screen, fridge, ceiling fan and casual comfort right on the beach. Premium beachside rental with even more space to lounge about. Located on the beach below Moorea Beach Club, these fully constructed bungalows are our premium beachside rental. 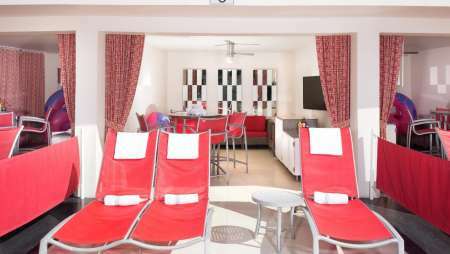 Uniquely located on the island of our quarter-mile Lazy River, these alcoves offer a relaxing, interactive and family friendly experience. This gigantic tropical playground offers three pools and several whirlpools. Surrounding the West Lagoon pools near the excitement of the lazy river and the beach, these cabanas offer a relaxing poolside escape. These units offer a relaxing Eastside escape. Tucked away by the East Lagoon pools and jacuzzi, these alcoves provide a bit of comfort and privacy. Ideal for guests who want a little personal space without giving up excitement. Located on the beach or adjacent to one of our pools, the gazebos provide personal space without giving up the excitement of the pool and beach areas. 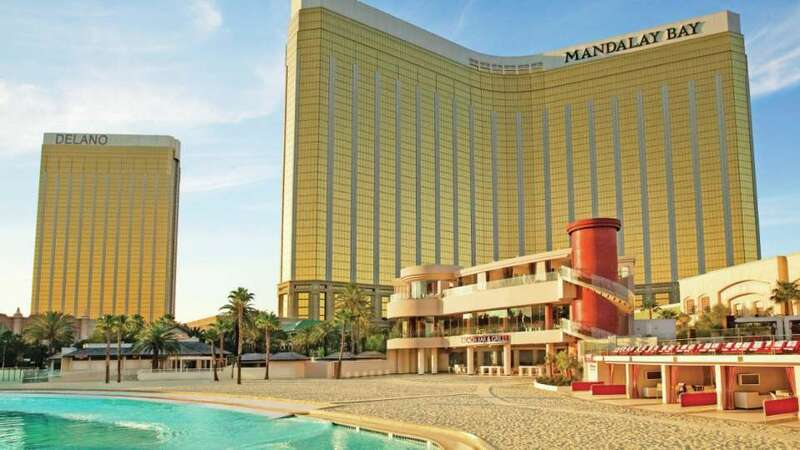 Non-Hotel guests are welcome to Mandalay Bay Beach with paid admission. Valid Monday – Thursday. Subject to availability. Blackout dates: April 22, May 22-30, June 10-20, July 2-4, August 12-15, September 2. Minors must be accompanied by an adult. Mandalay Bay Beach was created with a little something for everyone in mind, and the available menu accommodates in much the same way. Enjoy an open-air dining in the shade, grab a quick snack to enjoy back at your beach chair, or get food & drinks delivered without ever leaving your cabana. 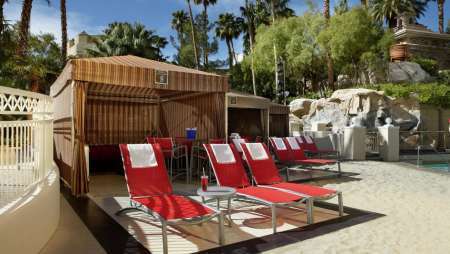 Order an icy concoction and sit in the cool shade at the Bikini Bar, just steps from Mandalay Bay Beach. Couple enjoying each others company while sitting at Mandalay Bay Beach in front of the wave pool. Girl exiting the Lazy River with inner tube at the Lazy River inside Mandalay Bay Beach. It's important to come properly equipped when you head to the beach. Whether you want to step out in show-stopping fashion or simply need a smidge more SPF, you'll find exactly what you need. Designer swimwear, shoes and handbags, jewelry, hats and sunglasses that reflect the freedom and fun of being a resortist. A quick pit stop for anything else you may need from spirits, sundries and snacks to collectible Las Vegas keepsakes. 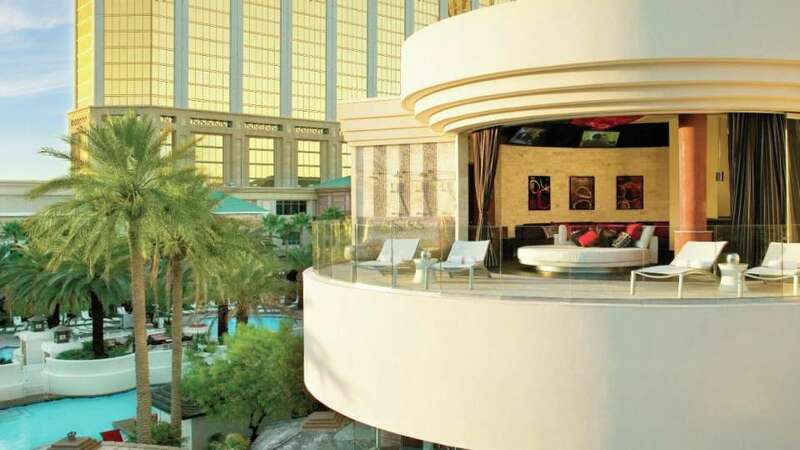 "One of the Best Pools in the U.S."
"9 Best Pools in Las Vegas"
Take the guest elevators down to the beach level and take a right toward Spa Mandalay. Exit the doors and follow the signs to Mandalay Bay Beach. Continue on the path and the entrance to Mandalay Bay Beach is on the right. Enter the doorways from the garage area and proceed on cobblestone walkway. Follow pathway as it veers to the right. Take left onto casino floor and follow pathway toward the lobby. Take escalators or guest elevators down to beach level. Turn toward Spa Mandalay. Exit the doors and follow the signs to Mandalay Bay Beach. Continue on the path and the entrance to Mandalay Bay Beach is on the right. You must be 48" to swim in the wave pool. Adverse weather conditions may alter facility times and pool availability. Q: Are there inner tubes available for purchase? Q: Does the wave pool have a height restriction? A: Yes. You must be 48" to swim in the wave pool. Q: Are lockers available at Mandalay Bay Beach? A: Yes. Lockers can be rented for $20/day. A $10 key deposit is required if you pay with cash. Q: Can I bring outside food and beverage into the facility? 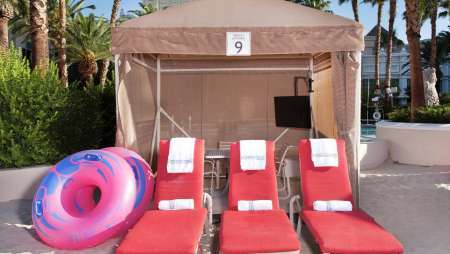 A: Unfortunately, outside food and beverage is not permitted into Mandalay Bay Beach and Pools. Q: Are life jackets available? A: Yes a limited number of life jackets are available. Q: Where are inner tubes allowed at Mandalay Bay Beach? A: Inner tubes are allowed on the Lazy River only. Q: Can I bring my own Inner tubes? A: Yes. Inner tubes must be circular, under 48” and have an unobstructed path to swim through.